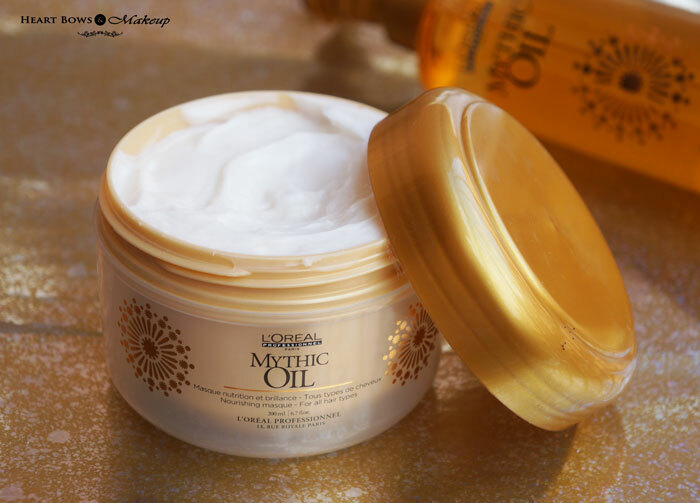 Give your hair a daily dose of moisture with L’Oreal Professionnel Mythic Oil Shampoo. The perfect combination of argan oil and cottonseed oil leaves hair deeply conditioned and gives a long lasting shine to dry hair. It’s a luxurious shampooing experience which refreshes and cleanses hair thoroughly. Argan oil is known for it’s calming properties. 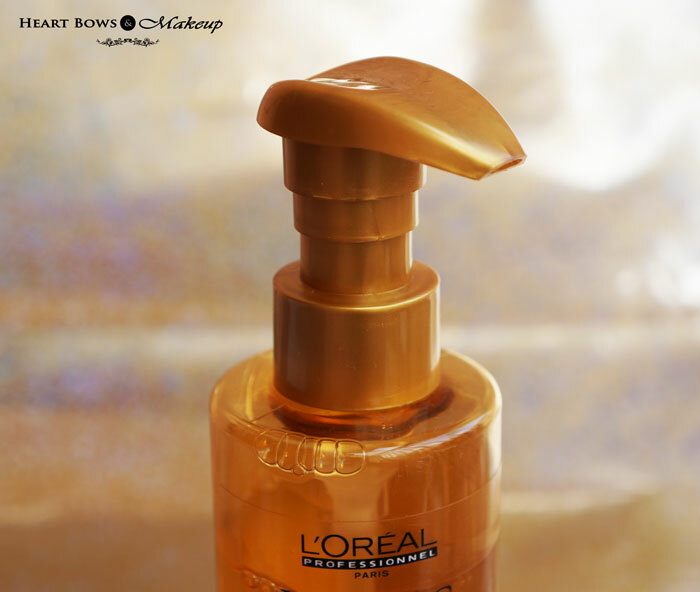 The L’Oreal Professional Mythic Oil Shampoo comes in a sleek and translucent gold bottle with a pump dispenser. The pump has a lock mechanism which prevents leakage in case you travel with it. It has all the product claims, list of ingredients etc mentioned on it. The shampoo definitely looks ‘mythical’ and I love the look of the bottle. I wouldn’t call it travel friendly but yes it is convenient to use. 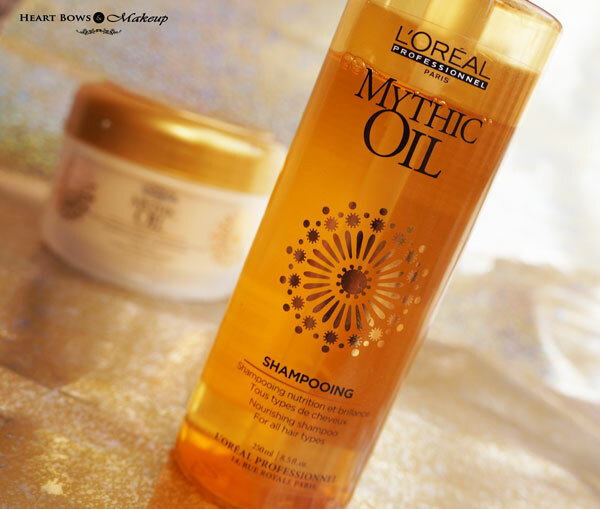 The L’Oreal Mythic Oil is a clear shampoo which is light in consistency. It has a beautiful warm scent, which I can’t completely describe but I like it. Its not fruity or floral or too strong. The shampoo does not lather as much as I’d like it to, which probably means it contains low SLS content. I usually need a 3-4 pumps for my thick, heavy and medium length hair. The shampoo adequately cleanses my hair without stripping off the natural oil. This is one of those rare shampoos that does not dry out my hair too much and makes it feel like a broom 😀 To test it out, I used this without a conditioner and while my hair did get frizzy but it did not feel as dry as it usually feels. When used in combination with the Mythic Oil mask, my hair felt amazingly soft! 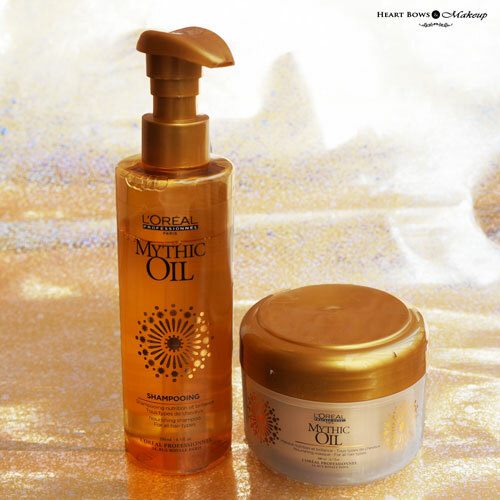 Restore your hair with L’Oreal Professional Mythic Oil Nourishing Mask. This intense conditioning treatment leaves hair feeling extremely soft and glossy. The formula contains argan, avocado, cottonseed and grape seed oil extracts which replenish and revive hair. Hair becomes irresistibly silky and lustrous.Enriched with the goodness of argan and avocado extracts for nourishment. Cottonseed and grape seed oils provide deep conditioning. 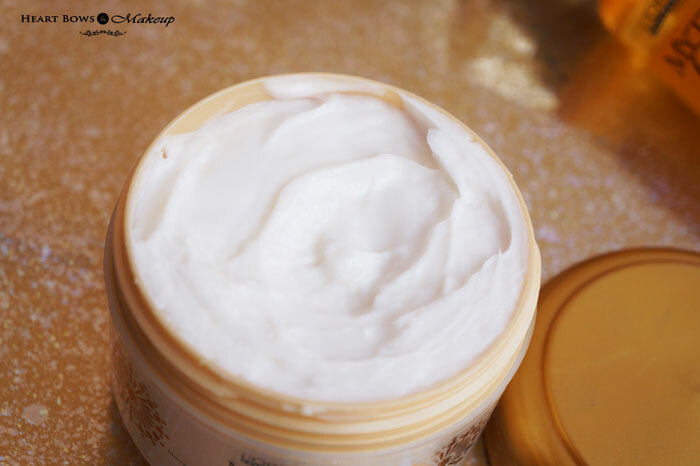 The L’Oreal Professional Mythic Oil Mask has a very creamy and buttery texture. 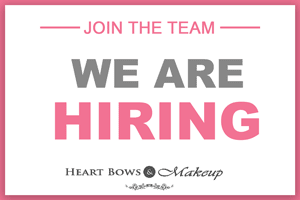 It has a slightly stronger scent compared to the shampoo which does not irritate my sensitive nose. It spreads easily and I apply it from my mid lengths to the ends of the hair. I usually use it more often as a conditioner rather than a hair mask. 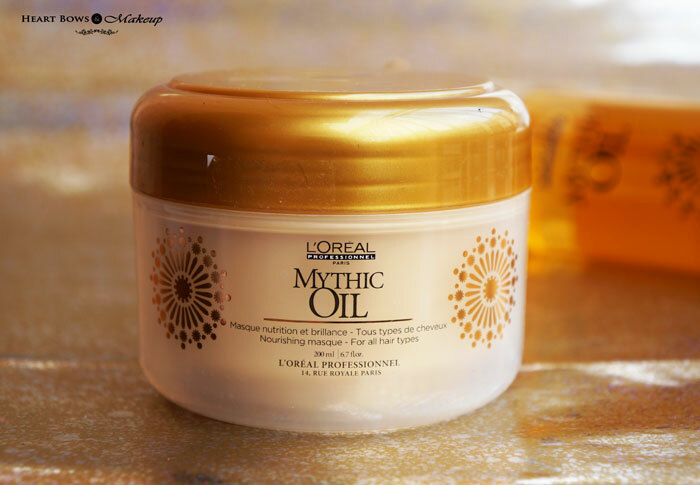 The L’Oreal Mythic Oil Masque does not weight down my hair at all. I apply it for 2-3 minutes after which I wash it off. It prevents tangling, makes my hair softer and controls frizz to a good extent. The combination of the Mythic Oil Shampoo & Conditioner work very well for me and helps in combating dryness and frizz. However, I feel the Liss Ultime mask felt a bit more hydrating than this one and I would’ve liked it to be more nourishing. HBM Recommendation: The L’Oreal Professional Mythic Oil Shampoo + Nourishing Masque works really well for dry and damaged hair. The combination made my hair feel softer and less tangled. 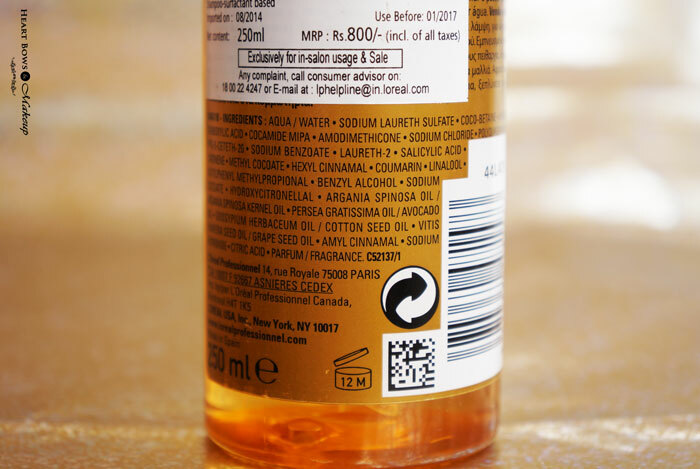 It contains argan oil, which has gotten really popular in hair care products for its benefits. The mask controlled my frizz to a good extent and overall I was quite pleased with the results. If you are looking for a gentle shampoo that effectively cleanses the hair and a conditioner that adds hydration without weighing it down then this range would work quite well for you!